Originally a Hughes-based design, the YAH-64 faced off against a Bell YAH-63 system in the United States Army's search for an advanced attack helicopter. The system was to field the latest in technology, maneuverability and battlefield survivability that was consistent with low-level, low-speed warfare. The end result saw the YAH-64 coming out ahead, and plans were underway to further develop the system as the principle attack helicopter of the US Army. Initial units of the now-designated AH-64A "Apache" became operational as frontline systems in 1986. The base AH-64 was designed with crew survivability in mind featuring anti-missile systems, specialized cockpit crew protection in the form of Kevlar armor and bulletproof glass and a specially designed superstructure. The short wingtip mounts offered up four original hardpoints to which the Apache system could field the powerful and accurate Hughes AGM-114 anti-tank missile. A total of sixteen of these could be carried on the underwing hardpoints. To take on softer targets, the conventional Hydra 70 general purpose rocket pod in various munition amounts and warhead types could be fielded alongside the Hellfire. The later addition of wingtip mounts allowed the system to field AIM-9 Sidewinder or AIM-92 Stinger air-to-air missiles. The system could also support the Sidearm anti-radiation anti-radar missile air-to-surface missile. The primary standard armament of the Apache consisted of the advanced chin-mounted Hughes M230 30mm chain gun with 1,200 rounds of ammunition setup that responded to the movements of the gunners head-mounted helmet system through the IHADSS helmet sight system. Traversing is limited to 11 degrees up, 60 degrees down and 100 degrees to either side. The Apache is crewed by two personnel seated in tandem with the gunner in front and the pilot seated in back. Design of the Apache was conventional with the cockpit in a stepped arrangement forward, the engines mounted high and to either side of the center of the fuselage and wing stubs just underneath the powerplants. The cockpit is designed flat glazed windows, crash supportive armored seating and reinforced landing gear struts. Engines (AH-64D) were by General Electric and featured the T700-GE-701C series turboshafts developing 1,890 shaft horsepower while driving a four blade main rotor and a four blade tail rotor. The tail rotor in and "x" type arrangement sat on the port side of the vertical tail fin. Landing gear were static with two main systems and a tail wheel. Wire cutters to improve survivability at low level were added to the top rear of the canopy, to each landing gear strut and one just forward of the chin turret base underfuselage. A chaff/flare dispenser kit was added to the aft portside of the tail assembly. Hughes Helicopters flew the prototype YAH-64 (73-22248) anti-tank helicopter on 30 September 1975. 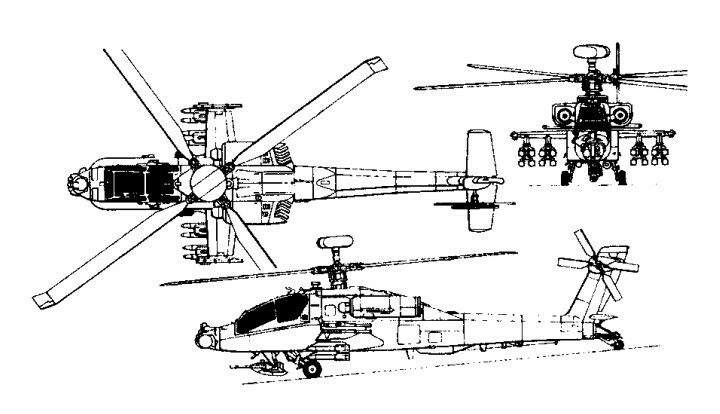 The first of two for evaluation against the Bell YAH-63 (the first, 73-22246, was flown on the following day); these were selected as finalists from design submissions for the US Army's AAH (advanced attack helicopter) requirement. Hughes Helicopters No 5 prototype of the AH-64 was fitted with 1,693 shp T700-GF-701 engines, in place of the 1,560 shp T700-GE-700s fitted previously in the prototypes. Hughes is proposing use of the -701 engine for production AH-64s to improve performance in high temperatures. In December 1976 Hughes won a US Army competition for an Advanced Attack Helicopter. The AH-64, as it is designated, under development with Army testing was powered by two 1,536 shp General Electric T700-GE-700 turboshaft engines. The Hughes Model 77, allocated the Army designation YAH-64A, was to prove the winner of the competition when flown and evaluated against the YAH-63 submission from Bell Helicopters. This two-seat attack helicopter is powered by 1,696 shp (1 265 kW) T700GE-701 turboshafts. Armament includes a 30-mm Chain Gun and up to 16 Hellfire ASMs. Stinger AAMs will give it an air-to-air capability. More than 550 McDonnell Douglas (originally Hughes) AH-64A Apaches had been delivered to the US Army by 1990. After spending some time deployed at home, the AH-64A set off for West Germany in the first overseas deployment of the type. First combat deployment was a short time later in 1989's Operation Just Cause concerning Panama and was made by the 82nd Airborne. 1991 saw the AH-64A model series deliver the opening salvos of action in Operation Desert Storm and later taking part in the much publicized "100-hour" ground war following in which some 500 enemy tanks were reportedly destroyed. Soon to follow were limited deployments in the Bosnia / Kosovo affair and finally in Operation Iraqi Freedom. Based on lessons learned in the Gulf War of 1991, the AH-64A model was followed by the proposed upgraded AH-64B series. This model sported a Global Positioning System (GPS), improved communications and navigation and an all new main rotor blade. Most of the A models were upgraded to this standard despite funding being lost on the proposal in 1992. The AH-64C appeared (sometimes referred to as AH-64B+) and featured much of the upgrades in common with the succeeding "Longbow" version to follow, sans the mast-mounted radar system and more powerful engines. An AH-64D model also appeared but was very similar to the AH-64C series with the exception of having a removable radar. The definitive Apache became the AH-64D "Apache Longbow" model. This model was distinguished by the noticeable mast-mounted AN/APG-78 Longbow radome system above the main rotor. The Longbow radar is a millimeter wave radar produced by Northrop Grumman and can guide the potent Hellfires through radar seeking frequencies for an even more improved kill ratio. Of the initial 800 or so AH-64A's produced for the US Army, no fewer than 500 were updated to the Longbow standard. As it is mounted high on the design, the Apache Longbow need only "peer" above the treeline to ascertain enemy positions and potential targets. Target sharing was also a part of the models new suite and allowed for multiple Apaches to "talk" to one another despite one of the other not having a target locked on in its tracking system. 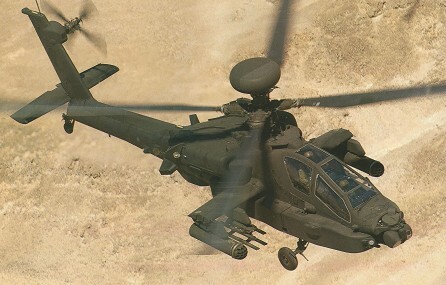 The Apache Longbow featured an uprated General Electric powerplant in the form of the T700-GE-701C series. Most all vital components were also updated to increase the potency of the machine while at the same time improve the crews survivability in the event of being fired upon, taking a direct hit or having to make a crash landing. The Apache Longbow remains in frontline active service and is seeing further enhancements and improvements made through additional Block updates which include new rotors, more digital automation integration with UAV battlefield elements. The improvement programme of the AH-64 "Apache" based on Westinghouse mast-mounted Longbow millimetre-wave radar and Lockheed Martin Hellfire with RF seeker, included more powerful GE T700-GE-701C engines, larger generators for 70 kVA peak loads, Plessey AN/ASN-157 Doppler navigation, MIL-STD-1553B databus allied to dual 1750A processors, and a vapour cycle cooling system for avionics. Early user tests were completed in April 1990. The full-scale development programme, lasting 4 years 3 months, wasauthorised by Defense Acquisition Board August 1990, but airframe work extended in December 1990 to 5 years 10 months to coincide with missile development, supporting modifications being incorporated progressively. The first flight of the AH-64A (82-23356) with dummy Longbow radome was on 11 March 1991. The first (89-0192) of six AH-64D prototypes was flown on 15 April 1992, the second (89-0228) flew on 13 November 1992, fitted with radar in mid-1993 and flown 20 August 1993. 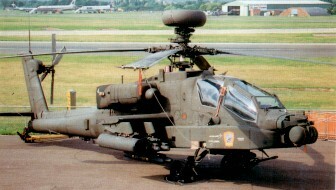 No 3 (85-25410) flown 30 June 1993; No 4 (90-0423) on 4 October 1993; No 5 (formerly AH-64C No 1) 19 January 1994 (first Apache with new Hamilton Standard lightweight flight management computer); No 6 flown 4 March 1994; last two mentioned converted from 85-25408 and 85-25477 and lack radar. 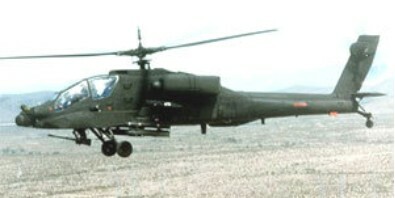 First preproduction AH-64D flown 29 September 1995. Six AH-64Ds to fly 3,300 hour test programme; first remanufactured production aircraft flown 17 March 1997 and delivered to US Army 31 March 1997. IOC scheduled for June 1998. Initial AH-64D battalion (1-227 AvRgt) to be based at Fort Hood, Texas; second (3-101 AvRgt) at Fort Campbell, Kentucky. A five year US$1.9 billion agreement for remanufacture was signed 16 August 1996. The contract covers 232 AH-64Ds over a five year period, with the entire US Army fleet of 758 AH-64As to be upgraded in remanufacture programme lasting 10 years, although only the initial 232 to carry Longbow radar. Production rate to rise from one per month in 1997 to five per month in 1999. Contract also included 227 Longbow radars (since increased to 500), 13,311 Hellfire missiles and 3,296 launchers. Agreement reached with US Army for a US$2.3 billion contract to remanufacture a further 269 AH-64As to the AH-64D Apache Longbow configuration from FY2001, to bring total to 501 and programme to 2006. First flight of Apache with initial enhancements incorporating COTS technologies for reduced costs, and first of second 269 unit batch, made on 13 July 2001. First flight of AH-64D with four new colour flat-panel MultiPurpose Displays (MPDs) 12 September 1997. Starting with the 27th production aircraft all Apache Longbows, including those ordered by the United Kingdom and the Netherlands, will be equipped with the Honeywell (AlliedSignal) Guidance and Control Systems MPDs. Capability exists to convert any AH-64D to Apache Longbow configuration in 4 to 8 hours; this potential was demonstrated in June 1994 when army personnel removed Longbow radar, associated equipment and T700-GE-701C engines from AH-64D prototype and installed them on second (non-radar) aircraft, which was then test flown for 30 minutes. AH-64D to equip 26 battalions; company strength to be three with radar plus five without; three companies per battalion. Longbow can track flying targets and see through rain, fog and smoke that defeat FLIR and TV; RF Hellfire can operate at shorter ranges; it can lock on before launch or launch on co-ordinates and lock on in flight; Longbow scans through 360° for aerial targets or scans over 270° in 90° sectors for ground targets; mast-mounted rotating antenna weighs 113kg. Production of RF Hellfire by Longbow LLC, a joint venture between Lockheed Martin and Northrop Grumman. Initial limited-rate production contract awarded in December 1995 for 352 missiles, of which first delivered to US Army Missile Command in November 1996. Further 1,056 missiles and 203 launchers subject of US$233.7 million LRIP contract awarded in 1996. Further modifications include 'manprint' cockpit with large colour flat-panel MultiPurpose Displays (MPDs) replacing standard monochrome MultiFunction Displays (MFDs), air-to-air missiles, digital autostabiliser, integrated GPS/Doppler/INS/air data/laser/radar altimeter navigation system, digital communications, faster target hand-off system, and enhanced fault detection with data transfer and recording. AH-64D No 1 made first Hellfire launch on 21 May 1993; first RF Hellfire launch 4 June 1994; first demonstration of digital air-to-ground data communications with Symetrics Industries improved data modem, 8 December 1993. Training of US Army instructors began summer 1994, in anticipation of Force Development Test and Experimentation (FDT&E) trial, using three prototypes, starting October 1994; followed by Initial Operational Test and Evaluation (IOT&E) January to March 1995. Successful completion of FDT&E and IOT&E precursor to start of modification programme in 1996; long-lead contract awarded to McDonnell Douglas December 1994 covering start-up funds for initial batch of remanufactured Apaches. Test successes of 1994 include June trial in which Apache Longbow tracked moving ground target with radar and scored direct hit with RF Hellfire; communication of digital data with Joint-STARS and UH-60 Black Hawk via improved data modem in September; demonstration of new tri-service embedded GPS/INS in October; and RF Hellfire ripple-launch capability in November, when single Apache scored hits on three targets at close, medium and long range with three missiles; time of engagement, from detection to target impacts, less than 30 seconds. Initial Operational Test and Evaluation exercises at Fort Hunter, California, in 1995 pitted six AH-64Ds against eight AH-64As. Test results indicated 400 per cent more lethality (hitting more targets) and 720 per cent higher survivability than the AH-64A; demonstrated ability to use Target Acquisition Designation Sight (TADS) or fire-control radar as targeting sight; detected, classified, displayed, prioritised more than 1,000 targets and initiated precision attack in less than 30 seconds; met or exceeded Army's situational awareness requirements (classified); available 91 per cent of time. Hit moving and stationary targets on smoky battlefield from 7.25 km (4.5 miles) away during test at China Lake, California. AH-64D deliveries to US Army began 31 March 1997. Initial AH-64D battalion (1-227 AvRgt) at Fort Hood, Texas fully equipped by end July 1998 and attained combat ready status on 19 November 1998, after eight month training programme at company and battalion level which included four live fire exercises and more than 2,500 flight hours. Second unit is 2-101 AvRgt at Fort Campbell, Kentucky; third will be 1-2 AvRgt in South Korea. First flight with Rolls-Royce Turbomeca RTM 322 turboshaft engines 29 May 1998. The British firm of Westland license-produced their own version of the AH-64D Apache Longbow, maintaining most of the major characteristics of the American type with addition of more powerful Rolls-Royce Turbomeca RTM322 engines of 2,210 shaft horsepower. The first flight of the first production WAH-64D Apache Longbow multi-mission combat helicopter for the United Kingdom, ZJ 166/N9219G, took place at the Boeing Company's Mesa, Arizona, rotorcraft facility on September 25, 1998. The 30min flight included hover tests, forward flight to 60kts (111 km/h) and rearward and lateral flight to 45kts (83km/h). Three days later and two days ahead of schedule, the helicopter was formally rolled-out at Mesa and delivered to prime contractor GKN Westland Helicopters Ltd. The first WAH-64 Apache Longbow for the British Army, ZJ168, re-flew from Yeovil on August 26, 1999. The first of eight WAH-64s being built by Boeing at its Mesa, Arizona, facility, it was delivered to RNAS Yeovilton on board HeavyLift Cargo Airlines Short Belfast G-BEPS on May 27 for reassembly and test flying. GKH Westland Helicopters has delivered the first WAH-64 Apache attack helicopter to the British Army. Eight more are scheduled to be handed over before the planned in-service date at year-end 2000. The aircraft, a derivative of the U.S. Army's AH-64D Apache Longbow, is one of eight built by Boeing at Mesa, Ariz., and shipped to Yeovil, England, for final assembly and test by Westland. The U.K. manufacturer will produce the remaining 59 aircraft in the $3.2-billion program. The army was to receive all 67 WAH-64s by 2003. Israel represents another active user of the Apache type and has operated the helicopter in countless sorties against Hezbollah positions including direct missile strikes on top operatives. Israel has fielded the Apache against Hezbollah positions in Lebanon and more recently in the 2006 summer war - also against Lebanon. Other operators include The Netherlands, Singapore, Greece, Saudi Arabia and the United Arab Emirates. Planned usage of the weapon system is expected by Pakistan, Taiwan and perhaps South Korea and India in the near future. Engine: 2 x GE T700-701.